Posted on July 9, 2017 by Ching under Community, Events. 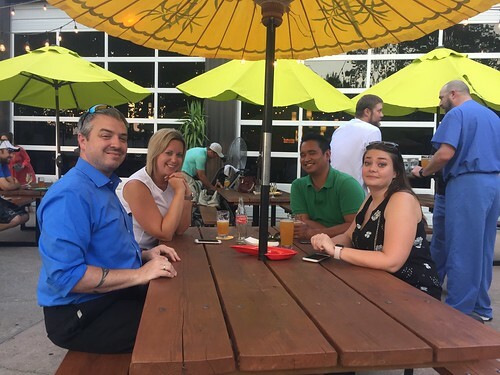 Here are some pictures from Child Start’s Brews & Books event at Central Standard Brewing a couple of weeks ago. I thought I would post the pictures first this time and tell stories later. Anyway, I invited a ton of people to this event but only a handful showed up. Boo! Although, I can’t say anything about Shane because he was the man! 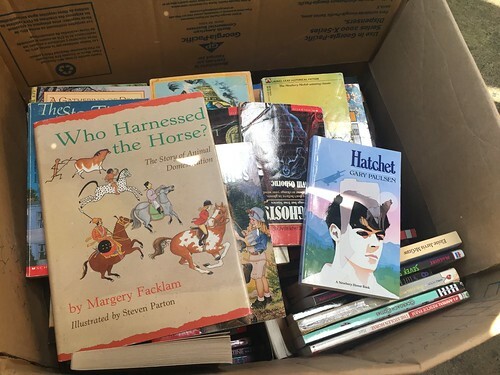 He gathered up a huge box of children’s books from Sara and the kids’ collection and, since he couldn’t make it to the event, he gave me the books at work so that we could donate them to Child Start on his behalf. 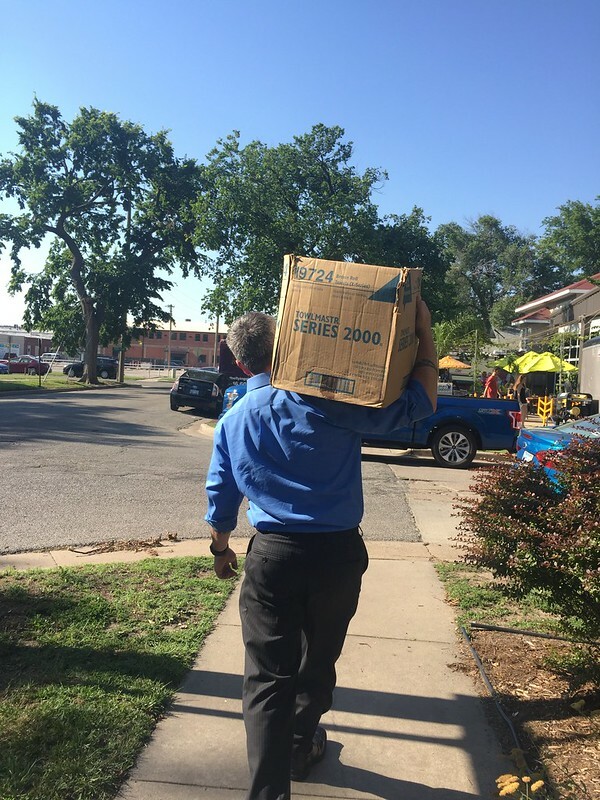 Brian got a workout carrying the big box full of books from the car to the event inside CSB. He is also the man! There is no way I could have gotten that enormous box full of books to the door by myself. This night was kind of interesting in many ways. First, I’d known about it a while since I’m on Child Start‘s development committee. It had been on the calendar for at least a couple of months and I even invited several coworkers to the event. About a week or so before this Chad, an old friend from college who I hadn’t seen or spoken to in years until recently, mentioned he would be in town for the week to pack up his stuff and move Kansas City. Chad was on Facebook for a while before he deleted his account almost two years ago and then just disappeared completely. I had no real contact with him after our MBA commencement other than playing Words with Friends on and off. It’s a game that he is apparently addicted to — I can’t say anything though, because I derive enjoyment from playing it as well. 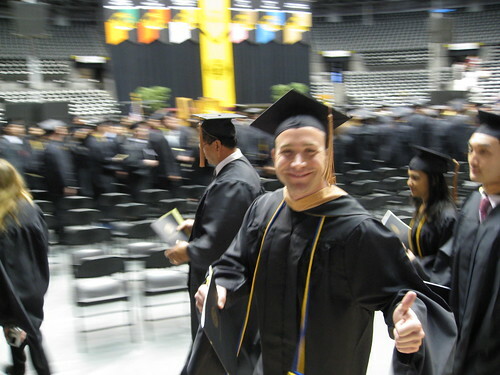 Here’s a picture of Chad from our MBA graduation/hooding ceremony in 2008. Obviously, we’d known each other for over ten years. I knew him mostly through school but I didn’t really know him very well outside of that. I was surprised when he hit me up to use me a reference for a job he was applying for earlier this year. I liked Chad. He was smart, hardworking, and easy to get along with. We worked together on some projects while in school and I never had any problems with him. There are people in college who are such slackers that you absolutely hate working with them and you hope to never see them again — ever. He was not one of these guys. Even though I knew very little about him personally other than he liked playing Words, and the request took me by surprise, I was happy to be a reference. Fast forward to a few weeks ago when he asked if Brian and I would like to meet up for dinner and catch up. I told him that sounds great but I would need to check with Brian. Brian and I checked the calendar and every single day after work already has stuff going on. We were completely booked up. I told Brian that I was just going to invite Chad to the Brews & Books event at CSB and kill two birds with one stone. Chad showed up. We had a nice time visiting and catching up. He also got to meet a few of our friends and acquaintances. Two of them were my coworkers. Yes, out of all of the people from work I invited, only Alex and Tisha showed up. They are the cool ones, though. Tisha even went above and beyond by purchasing books from the Blue Baboon book truck and donating some to Child Start. She helped in a couple of ways because Blue Baboon committed to donating a portion of the revenues from that evening to Child Start. The rest of us helped by drinking beers. I think CSB donated $1 to Child Start for every beer sold that night. Despite most of my invitees not showing up, it was a great turnout. The place was completely packed inside. That’s how come we ended up sitting outside. 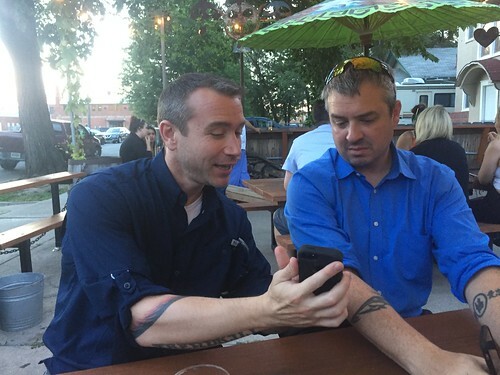 It worked out great because it was a nice evening and it’s a lot easier to have conversation on the patio where it’s not as loud. Were it not for Alex who got there first though, we probably would not have had anywhere to sit at all — inside or outside — it was that busy! The organizers did a great job of spreading the word but also part of the credit goes to the Flying Stove, my first favorite food truck. CSB is always packed on the nights when the Flying Stove is parked there. Speaking of invitees, Brian and I were at the dog park in Andover with our girls the day before and we met Ray (the dog pictured with Brian above) and his owner Megan. She’s really friendly and we had good conversation. We found out that she’s looking for a new home for Ray for when she moves to the East Coast for school. 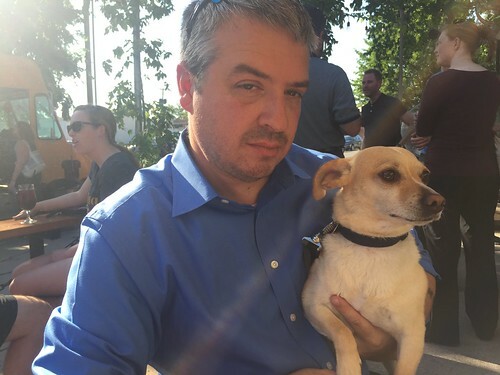 We mentioned that we would be at the Brews & Books event at CSB and that she could come and bring Ray and perhaps introduce him to some of our friends and one of them may fall in love and adopt him. We really had the Travel Junkies Jay and Becca in mind but they couldn’t make it. Actually, we didn’t think Megan would actually show up, after all we were complete strangers. Not only did she show up and bring Ray, she also brought a couple of books to donate to Child Start, which was a really nice and generous gesture considering that the day before, when we were chatting at the dog park, she told us that she’s one of these people who cannot bear to part with books. Anyway, how is it that my friends don’t show up to events I’ve invited them to but someone I’d only known a few hours does? I really like Megan and she did me a solid by showing up. I think she should become my friend. LOL. Later that evening we run into Misty’s sister Michelle and her friend Sonny. They end up sitting and visiting with us. The funny part about this is Alex also knows Sonny from her days working at Heroes. As they’re catching up they realize that they live only a few yards from one another. Wichita is such a small world! There were lots of positive things that happened that evening besides the book drive and raising awareness for Child Start. Some of our friends got to meet one another. Brian and I got stamps on our Wicked Brew passports (more on that next time, probably when we finally earn our shirts). The best part is I managed to plant the seed for hosting a party at our house. Brian hates throwing parties because he doesn’t like having a bunch of people over. I love having people over but, because it takes so much effort to convince him, we hadn’t had a party in over a year. Maybe it hasn’t been that long but it definitely feels like forever. It took a little bit more discussion after that night at CSB but I did manage to get Brian on board and in party mode. The party happened last weekend and it was interesting. Come back next time and I’ll tell you that story. 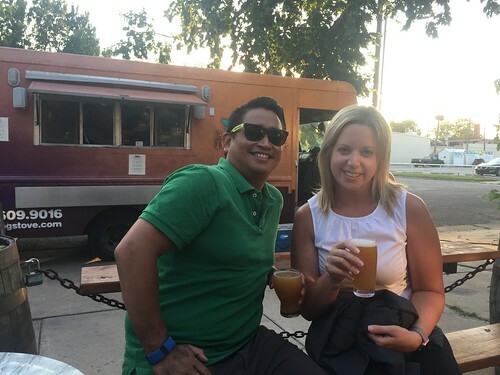 Replies to "Child Start’s Brews & Books Event at CSB"